Crabby's Treasure Chest: What is Crabby's Treasure Chest? Our gift to you! Download the list of events you'll receive one free ticket per day, per activity, for the activities you book. Example; if everyone in your party is going on a dolphin cruise, one of the tickets will be free. If just 3 of you are going for a round of golf, one of you will be playing for free. Download the Crabby app and then be on your way to a day full of from Crabby, and all of us at SeaStar Vacations. Reservations can be made 24 hours in advance. The cumulative daily value of these services is up to $260. Free amenities not valid on rentals 25 days or more. 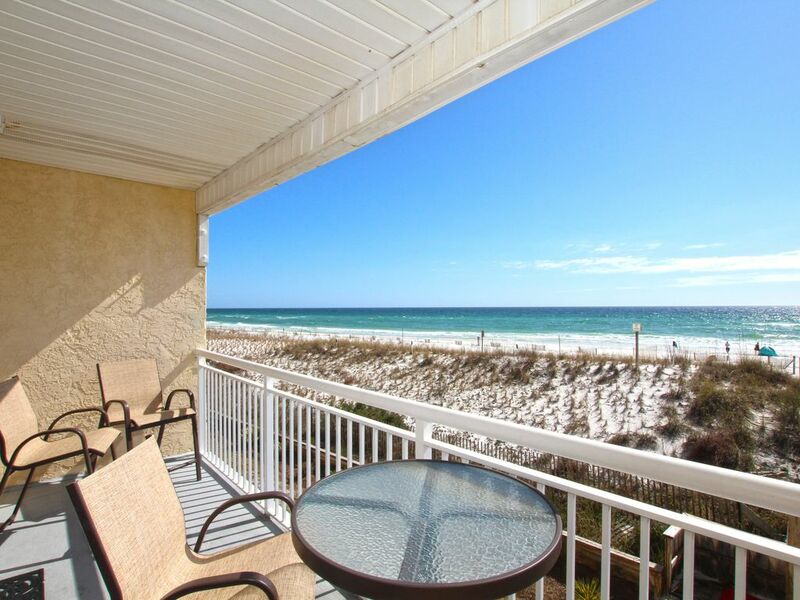 Enjoy the sugar-white sands of the Okaloosa Island just minutes from Destin. The ocean is just steps from your room where every day is a flip flop kind of day. Our relaxing balcony provides a breathtaking, unobstructed view of the beach -- the emerald waters -- gorgeous sunsets -- and frolicking dolphins. No shoes, no shirt, no problem just sit back and enjoy our accommodations including a newly decorated master bedroom with a private ½ bath. Theres room for all in this smoke-free unit an additional full bath and a queen-size sofa sleeper in the living room. The spacious living room also features two sliding glass doors overlooking the beach dining area -- and fully equipped kitchen which includes a washer/dryer for your convenience. Life is better at the beach with these amenities -- assigned parking -- new swimming pool with bathrooms private beach access -- and barbeque area. Our housekeeping service provides everything from soap to towels -- just bring the suntan lotion. So, if you are looking for the perfect Gulf Front vacation -- look no further -- where the view of your life meets the best value under the sun! a. Pets will not be allowed for renters from April 1 to October 14.
b. One pet, under 25 pounds, will be allowed for renters from October 15 through March 31.
c. There will be a $50.00 per day/pet fine for pet violations. The fines will be charged to the guest. SeaStar Vacations www.seastarvacations.net 706-490-3992 Vacation Rentals at these locations: Navarre Beach, Okaloosa Island, Destin. Miramar Beach, Scenic Hwy. 98, 30A, Santa Rosa Beach, Rosemary Beach and St. George Island. Older building but condo updated nicely. Right on the beach which was awesome!! Also loved sitting on the balcony watching and listening to the waves. The kitchen had everything we needed as we cooked several meals there. When we got there the floors seemed to not have been swept real well and the bathtub is slippery. I slipped getting in but caught myself and my husband almost slipped. Also the washing machine was loud but glad to have washer and dryer in the condo. Other than that we had an excellent stay. There's just no place like the gulf to spend your vacation.beautiful white powered sand is the best! My husband and I stayed here Island Sands 205 the last week of July. We were looking for a place that was less congested than other places we've stayed. Upon arrival, the unit was ready and clean and just as the photos depict. The unit was just the right size for us. The view is great and the fact that there was not an elevator needed was even better. The beds slept comfortably, everything worked in the kitchen that we used. & loved having the w/d right there. The balcony has plenty of room to sit and relax. the property landscape was actually very pretty with palms & flowers by the dunes. the bridge/walkway going over to the beach was very short walk & so convenient. It was everything we could have asked for. I only gave 4 stars because of these small things that may not make any difference to someone else: first, I loved that it has 1 1/2 bathrooms, however they're both small. Ladies, the lighting in the bathrooms was not very good for putting on your makeup. I wished there would've been a broom available. I guess it's locked up, but I'm one that likes to sweep the sand up every day. Even though you shower off when leaving the beach, you still end up w/sand. I almost went and bought one but didn't. There is construction going on next door. Not owners fault at all, but they worked almost every day and it was loud.I don't know when it will be finished. Finally, this unit is on the 2nd floor. There was quite a bit of noise that came from the 1st floor. They had a young boy I believe and the child was never still because he walked and ran through their unit from one end to the other every day so that was pretty annoying. These are small things as I said but wouldn't prevent revisit. This one is on mother nature and no one else, it rained/stormed on us 6 out of the 7 days.We got in some beach time though. Eating out: fav was AJ's went about 8pm, food was delish and live music a plus. Italian-Ali's Bistro was good. went into Destin to eat a couple times but didn't care for the traffic/drive. Overall our trip was very nice and our 1st stay in Ft Walton. Thank you! We love our house too! I hope you'll make it your place at the beach for many years to come. Thank you so much for letting other VRBO readers know all about it, and for taking the time to write to us. Very happy with the condo. I've stayed st several of the properties at island sands and have always been happy. Hopefully we will be able to purchase one of their condos in the future. Thank you! We love our house too! I hope you'll make it your beach destination for many years to come. Thank you so much for letting other VRBO readers know all about it, and for taking the time to write to us. If your looking for a great view from your balcony, right on the ocean this is the place......BUT the condo could use some updating & maintenance - the toilet off the master bedroom was about to come loose - the wifi quit working & it's because the surge protector had died. The shower would not operate correctly - as it would not fill the tub/ shower only. The wicker sofa couch is not comfortable. But the kitchen was nicely equipped, just prepare to bring your own trash bags (they only leave you 1) and toilet paper, soap & paper towels. The construction next door made for an early rising every morning. But it's a short walk to the ocean/beach which was wonderful. Thanks so much for taking the time to write me . Had I received a call, text or email I could have had the repairman there within an hour. In the future please call me if you find anything not working properly and I'll take care of it right away. It is regrettable that I cant do anything about the construction next door and as for trash bags, soap and toilet paper, again, if there wasn't enough there to get you thru a day before you went shopping, a phone call, text or email would have resolved this. On your next visit be sure to keep my contact information handy, are happy to resolve any issue you might encounter. We could not have wanted anything better from the time of arriving to the time we left. Gorgeous sunsets, white sand, no loud music, everyone being courteous to one another & the master king bed was so very inviting after a day on the beach. The fully stocked kitchen (pots, pans utensils etc.) had everything you would ever need to cook a home cooked meal & that’s important if you stay for 3 months as we did. If you did have an issue with anything, it was corrected promptly & efficiently. The balcony became our daily friend to watch the waves, dolphins, sunsets, people, have our dinner, and just relaxing & having a cocktail. We would recommend it for a weekend getaway or a 3 month stay, or however long you want to experience paradise.